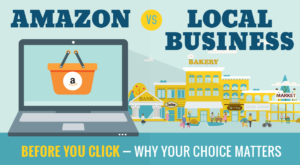 You’re a small retailer, and you’re nervous about Amazon.com. Well, you shouldn’t be.Sure, they’re a giant, and aggressive. Yes, people may be able to find the same products you sell for a cheaper price on Amazon. Many may not have a problem waiting a day or two to have it shipped to them (oftentimes for free). Yeah, yeah, Amazon’s got the money, the resources, the technical know-how, the brand, the buzz and the media’s ear. You’re just running your little shop on Main Street. But so what? You can still beat Amazon. Amazon is always going to be more convenient than you because they’re online 24/7. But you can still be convenient — enough. Here’s a hint: most people work between 8 a.m. and 5 p.m., so for God’s sake consider opening up early and closing up late. You may need to keep things open on Saturdays and Sundays. 2. Give your products away. How many other retailers are scared of Amazon? Lots. But now you know not to be. So spread the word. Take a walk around your strip mall or Main Street. Have everyone make up flyers. Offer flyers for other stores in your store. Cross-sell. Share advertising costs. Send leads to them. They’ll send leads back to you. Invite them to participate in your events. Have them co-write some blogs. You’re all in it together. And together you can beat Amazon. You are not a retailer — you are an expert in your field. You know more about the products you provide than Amazon does, so prove it! Look into great all-in-one online services such as LocalVox and Demandforce. This way your website will be optimized for smartphones, you can be found quicker, manage your online advertising, Facebook and Twitter communications will improve and you can offer coupons and other incentives. 6. Get a customer-relationship-management (CRM) system. It’s just a simple database. Try inexpensive products such as Zoho, Nimble or Insightly. Then build your database. Collect the names, addresses and emails of anyone who comes into your store. Use your CRM system to create lists so that you can communicate with your customers. Remember, you’re part of your local community. Deep down, people like to support their local community. They know that the more nice shops (like yours) that there are in their town, the more attractive their community is (hint: higher real estate values). 8. Finally, put your face on your business. If you look at my website you’ll see a big picture of me on the homepage. I know — it’s a face for radio. And no, I wasn’t George Costanza’s body double, OK?